Whenever you perform a search in mSupply resulting in more than one item being found, you will be presented with a list of records (be they items, names, contacts or another list) that matches the criteria you entered. 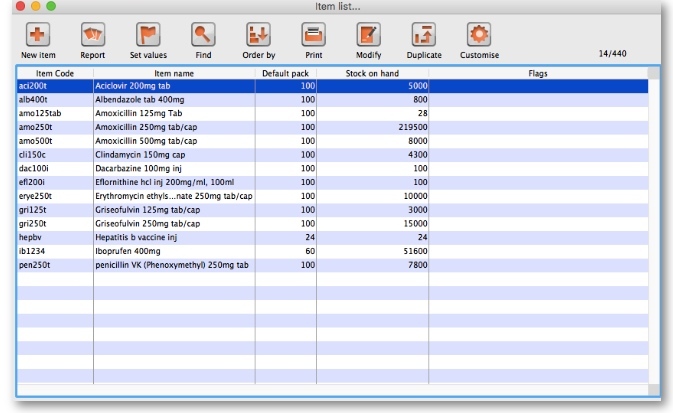 mSupply uses two types of list display. Shorter lists, such as those you see when you view an invoice, or view the stock for an item employ a list with a striped background. These lists have resizable and moveable columns, and have an indicator to show the sorted column. Their use is discussed in the next chapter. In this chapter we are concerned with tools for handling lists of names and items and transactions, which run into hundreds of thousands or millions of records. On the right is a list of columns you are currently using. On the left is a list of available columns. To add a column to the view, click on the item in the left-hand list, then click the right–pointing button in between the lists. You can control-click to add multiple columns at the same time. To remove a column select the column(s) to remove from the right-hand list, and click the left-pointing button to move the columns back to the available list. You can not remove the first column in chosen list, as it is a hidden key column to identify each row uniquely. Renaming columns: By clicking twice on a field name in the right hand list you can change the column title. Column widths: The easiest way to set column widths is to drag the dividers between the columns in the list view.. Note that if the total column width is too wide for the window, a horizontal scroll bar is added to the list allowing you to view columns to the right of those displayed. Choosing the column order: To change the sequence of the columns in a list, drag a column header to a new location. This is done when viewing the Item list window, not in the Customise columns window. Viewing or editing a particular record: To view or edit a record, double-click the row in the list you wish to view. A new window will open showing the details of the record you clicked. Descending means the opposite of Ascending . 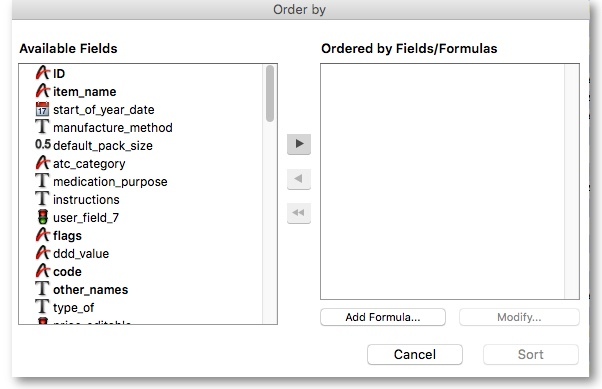 You can order by multiple fields by adding further fields to the right-hand list. 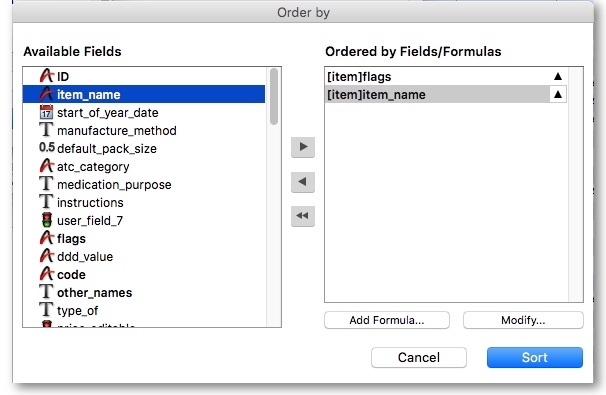 To change to ascending/descending ordering: Each item in the “Ordered by Fields” list has a small triangle to the right. If pointing up, the ordering will be ascending. If pointing down, descending. To change the direction, click on the triangle. 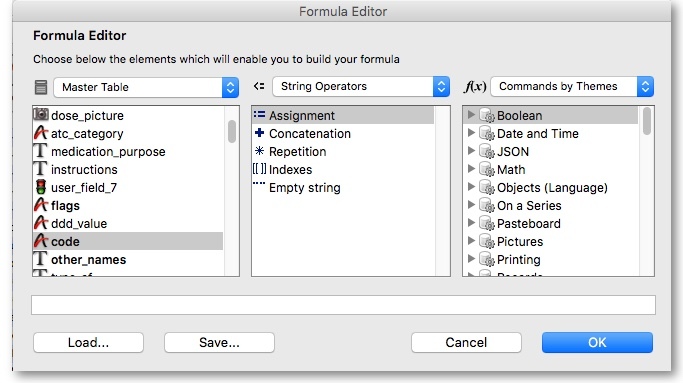 Using formulae: If you want to order by a formula, click the Add formula button. Here the formula window is shown, and the formula “Length([items]code)” has been entered. Using this formula would allow you to identify items whose item code is shorter/longer than your organisation's specifications. Once the details are entered, click the Order by button to order the list. You can press the print icon to send the list to Excel. The list will display in Excel with the column headings you have selected. In the item list shown above there is a Find button. This button shows a simple find window where you can enter the start of the item name or code. Within this window there are four areas from which you have to choose or set a value for each line of a query. 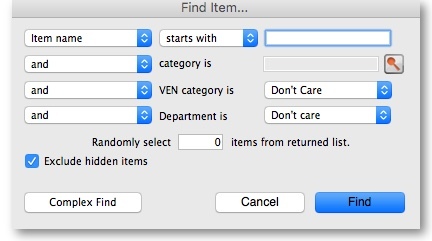 For queries with more than one criterion, click Add line , .then …. Click on “default_pack_size” in the available fields list. Enter “10” (no quotes) in the value field. Scroll down the available fields lists then click on “code” in the available fields list. Enter “a@” (no quotes) in the value field. Click the Query button to perform the query. The upper area of the query editor shows a summary of the query that is about to be performed. This example will return a list of items where both the search criteria are met, because the conjunction And was used. If you wanted to find items that matched only one of the criteria entered, you would click on the second line in the large upper panel to select it, and then click on the Or button where the conjunctions are displayed. Saving and Using saved queries: If you have spent time on developing a particular query , and you are likely to use the same query in the future, click the Save button. You will be asked to choose a name and location to save the query. The saved file is very small. When a blank query window is first shown, you can re-use a previously saved query by clicking the Load… button and locating the query file.